There were fears among the All Progressives Congress chieftains on Friday, following the defection of former Vice-President Atiku Abubakar from the ruling party. Our correspondent gathered that although the APC was expecting Atiku’s exit, it dawned on it on Friday that the former vice-president’s action could lead to mass defection from the ruling party. It was learnt that the fears were worsened by the feeling of some leaders of the party that the fate of the Peoples Democratic Party in 2014 could befall the APC before the 2019 elections. In 2014, the PDP was weakened following the exit of some governors and National Assembly members, including a former Kano State Governor, Rabiu Kwankwaso; ex-Rivers State Governor, Rotimi Amaechi; Senator Bukola Saraki, and the then Speaker of the House of Representatives, Aminu Tambuwal. Chieftains of the APC, who confided in Our correspondent on Friday, said although the ruling party had been waiting for Atiku’s defection, it was uncomfortable with the fact that there were many aggrieved members who would soon dump the party in power. One of the party leaders cited Kwankwaso and a former Lagos State governor, Asiwaju Bola Tinubu, as two of those who were not happy with the way the party was being run. He said more than two years after coming to power, President Muhammadu Buhari had not made appointments that would bring into government those who worked for his election. In a statement on Friday morning, Atiku explained why he left the APC. He said that while other parties had purged themselves of the arbitrariness and unconstitutionality, the ruling party adopted same practices. Atiku disclosed the decision to leave the ruling party in a statement he personally signed. He went down memory lane to recall that on December 19, 2013, he hosted members of the APC in his house in Abuja. He said the party members were there to appeal to him to join the APC after he left the PDP because of the crisis emanating from the special convention of the former ruling party on August 31, 2013. He recalled that he and several of his loyalists were left in limbo at the time the APC came calling. 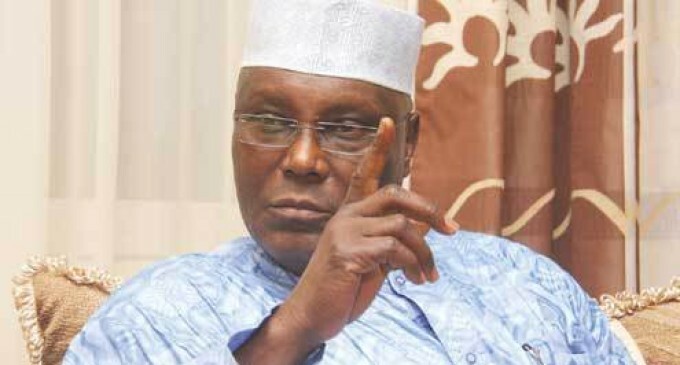 Atiku said, “It was under this cloud that members of the APC made the appeal to me to join their party, with the promise that the injustices and failure to abide by its own constitution which had dogged the then PDP, would not be replicated in the APC and with the assurance that the vision of the founding fathers, which I had for the PDP, could be actualised through the All Progressives Congress. “It was on the basis of this invitation and the assurances made to me that I, being party-less at that time, due to the fractionalisation of my party, accepted on February 2, 2014, the hand of fellowship given to me by the All Progressives Congress. Explaining the reason behind his decision to leave the APC, Atiku said events, which unfolded soon after the party took power, proved his earlier optimism was misplaced. He said like any other human and many other Nigerians, he was fallible. He expressed disappointment that since the memorandum was written, nothing had been done to address the issues raised in it till this day. Atiku accused the party of making false promises especially to those who were invited to join. “More importantly, the party we put in place has failed and continues to fail our people, especially our young people. How can we have a federal cabinet without even one single youth? “A party that does not take the youth into account is a dying party. The future belongs to young people,” he said. He further explained that he arrived at the decision to leave the APC after due consultation with his God, family, supporters and the Nigerian people from all walks of life. When contacted, the APC National Publicity Secretary, Mallam Bolaji Abdullahi, said, the party was waiting to see the number of people that would follow Atiku. Abdullahi, who said politics was about interest, stated that the party had not got any formal notification of Atiku’s resignation. According to him, “If the former vice-president feels that his interest is better served elsewhere, we can always wish him good luck. “For us, the task of building a political party is not a day’s job. It is a marathon and it takes many years and we will continue to improve our system until we are able to get the kind of party that we want to really build.